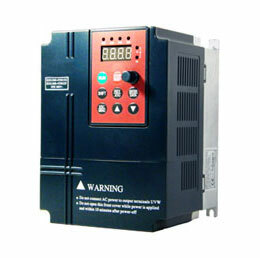 A Variable Frequency Drive is a motor control device that protects and controls the speed of AC induction motors. 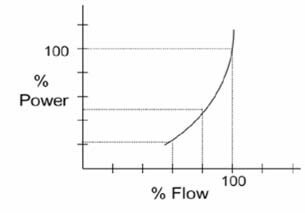 From the VFD basics theory, we know a VFD can control the speed of the motor during the start and stop cycle, as well as throughout the running cycle by outputting adjustable frequency. 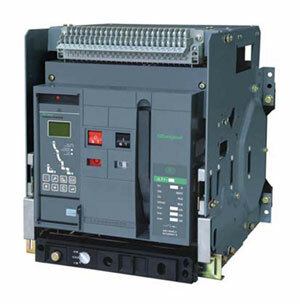 It also refers to as Variable Speed Drives (VSD), Adjustable Speed drive (ASD) and frequency inverter. Single phase 220V - 240V 50Hz/60Hz input, three phase output. p = number of motor poles. AC supply comes from the facility power network (typically 480 V, 60 Hz AC) while the rectifier converts network AC power to DC power. 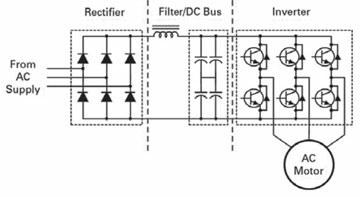 The filter and DC bus work together to smooth the rectified DC power and to provide clean, low-ripple DC power to the inverter (see Fig. 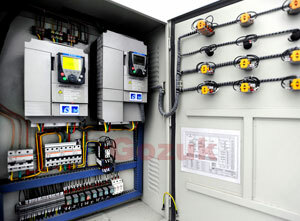 1: The function of a standard VFD, now there is new technology in vector VFD). 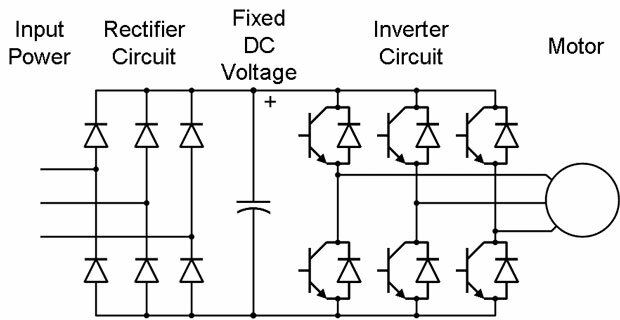 The latter uses DC power from the DC bus and filter to invert an output that resembles sine wave AC power using a pulse width modulation (PWM) technique which switches the inverter semiconductors in varying widths and times that, when averaged, create a sine waveform (see Fig. 2: A pulse-width modulated waveform). The benefits of VFDs are numerous and they offer the greatest energy savings for varies applications, the most common is VFD for pumps and fans. 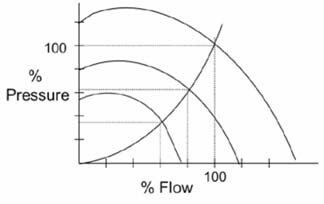 The adjustable flow method changes the flow curve and drastically reduces power requirements. 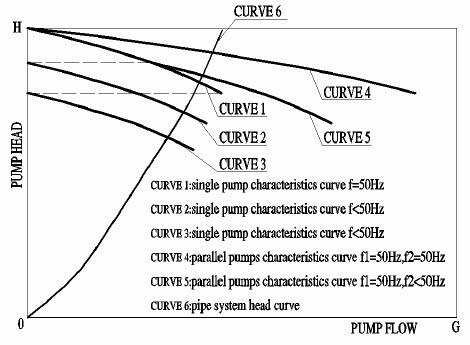 Centrifugal equipment such as fans, pumps, and compressors follow a general set of speed affinity laws. 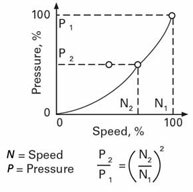 The affinity laws define the relationship between speed and the variables flow, pressure and power. 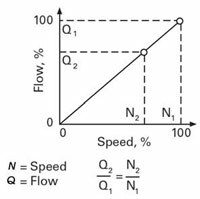 Based on the affinity laws, flow changes linearly with speed while pressure is proportional to the square of speed. The power required is proportional to the cube of the speed. 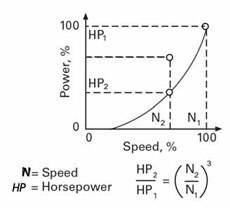 The latter is most important, because if the motor speed drops, the power drops by the cube (see Figs. 3 to 5). 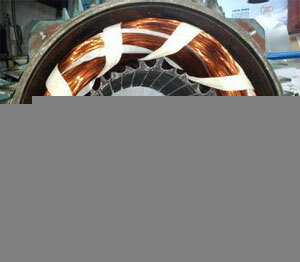 Therefore, the power required to operate the fan at 80% speed is half the rated power (see Figs. 6 and 7). Ready to buy a VFD? Check out the VFD price list. I have delta connected capacitor banks with Auto Power Factor Controller on 440 V bus. 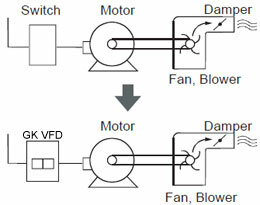 Also motors are connected on the same bus with VFDs for starting. 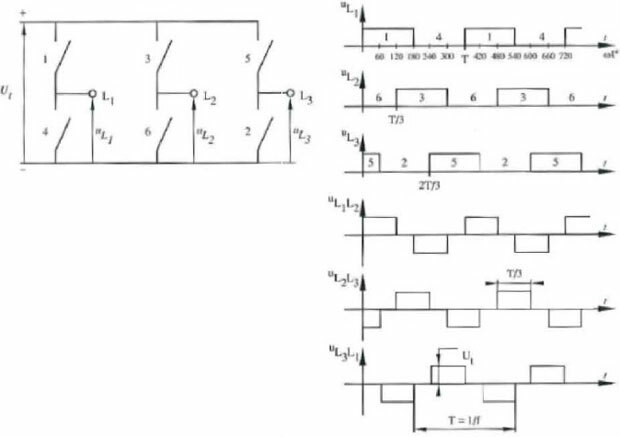 The question is that is there any harmful effect on the VFDs due to capacitor switching (in steps)? Does using a synchronous motor for reactive power control much better due to its smooth control?